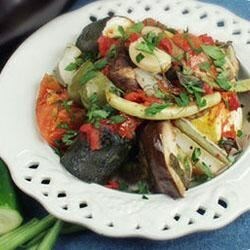 "This is a very tasty dish consisting of all kinds of fresh vegetables and herbs baked in the oven. This will tantalize your taste buds. It has been a sell-out at our Greek Church at every function for five years now. We serve this on toasted, warm pita bread." I REALLY LOVED THIS RECIPE AND I DON'T EVEN LIKE EGGPLANT THAT MUCH. IT WAS REALLY QUICK TO PREPARE EXCEPT FOR THE EGGPLANT AND SIMPLE TO MAKE. DEFINITELY A WINNER.